China Seeing Dawn of a Labor Movement? This story was filed by CBS News correspondent Celia Hatton in Beijing. 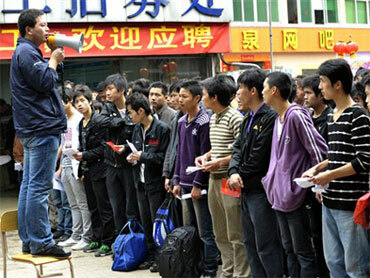 Striking autoworkers in southern China demanding better pay and job benefits? Just a few weeks ago, that's not something you would have seen in the media headlines here. Since foreign companies began flooding into China in the 1980s, low-wage laborers have formed the backbone of the country's flourishing economy. Few other countries could offer an almost endless supply of relatively well-educated, healthy young laborers who would toil for long shifts without complaint. The only legal labor unions in China are sanctioned by the Chinese government, which has ample reason to keep work disputes to a minimum. That could be changing. About 1,900 workers at a Honda manufacturing plant in southern China's Guangdong province successfully negotiated a pay raise after walking off the job for more than ten days. The company had reportedly been hiring trainees to work for less than the Chinese minimum wage of $920 a month. Nearby, employees at Foxconn, a major manufacturer of Apple products, Nokia phones and Dell computers, are gaining an average 20% raise after a spate of suicides captured international attention. The Chinese media also reported a one-day work stoppage at an auto parts plant outside Beijing that supplies Hyundai. China has long been hailed as the "world's factory" but, until now, few have asked what goes on behind the factory's closed doors. In the case of Foxconn, labor activists have complained about conditions there for years, but the world's media ignored the problem until young workers began to kill themselves at an alarming rate. Some analysts point out that a factory that employs 400,000 people is the size of a small city; of course some people within such a huge group would commit suicide, they argue. But even if the suicides can be attributed to a variety of things going on in the victims' lives, it's still difficult to shrug away the allegations of military-style discipline used by the company. Even China's tight-lipped state-controlled media have devoted front-page coverage to the issue, detailing stories of Foxconn workers who paid middlemen to score jobs on the manufacturing lines, only to find themselves trapped in its prison-like atmosphere. Employees would routinely work long hours of overtime without being allowed to sit down or speak to one another. Chinese media reports detailed how workers would be fined large amounts for minor infractions -- fines collected by violent security guards. Low wages are the source of unhappiness at many Chinese manufacturing plants. According to Geoffrey Crothall, an analyst with the Hong Kong-based China Labor Bulletin, says before the recent pay raise, the average Foxconn worker made around $130 a month, working full-time hours. With overtime, that monthly salary would rise to $292 a month. Chinese media outlets abruptly stopped their coverage of the events at Foxconn, Honda and Hyundai in the past few days, so it' difficult to track the ongoing impact of the uprisings. June 4 is the anniversary of the 1989 crackdown on pro-democracy demonstrators in Tiananmen Square, so this is a sensitive time for the Chinese government. However, as the months go on, it will be possible to see if any real change has taken place in China's factory belt. It must be noted that, so far, Chinese leaders have only permitted strikes and media coverage of labor unrest at foreign manufacturers. The doors to the world's factory will only be open when domestic Chinese companies fall under the same spotlight.